Bow Wow Net Worth - How Much Does The Young Rapper Own? Shad Gregory A.K.A Lil Bow Wow or Bow Wow holds the title of the youngest rapper to claim the top spot in American Music Charts. His first album was “Beware of the Dog”, which he released in 1998 and at that time, he was only 13 years old. The total net worth of the rapper is fifteen million dollars. His net worth has further increased when he started to take up Hollywood ventures. He made his first debut as an actor in 2001 in “Carmen: A Hip Hopera” as a supporting actor. His other movies are “Like Mike (2002)”, “Johnson Family Vacation (2004)”, “Roll Bounce (2005)” and “Lottery Ticket (2010)” in which he was cast as the lead actor. He also appeared in other movies in which he played a supporting character role and appeared as a Cameo. The Rapper also has a documentary film named “Who is Shad Moss? (2011)”. Apart from acting and singing, Bow Wow also is also the host of “106 & Park” show from 2012 to 2014. He is also appearing as a regular in the “CSI: Cyber” T.V. show as Brody Nelson. Whereas he is also seen acting in many other T.V. shows. Although Bow Wow has a general net worth at his age, but if compared to his inspiration and name giver i.e. Jay z and Snoop Dog’s net worth, they both are standing way ahead of him, Jay Z’s net worth is estimated as 560 million dollar and net worth of Snoop Dog is 135 million dollars. Shad Gregory “Bow Wow” was born in Columbus Ohio to Alfonso Moss and Teresa Caldwell on 9th March 1987. Ever since he was only a three year old, he was greatly intrigued by Rap. At age 5 he was able to repeat rap lyrics that were broadcasted on the television and till age 6, Bow Wow had started rapping for live audiences and small concerts. The young rapper was first noticed by Snoop Dog while performing at a Concert in 1993 in Los Angeles and there he was bestowed the name “Lil Bow Wow” by him. Later on Snoop Dog started taking him to open concerts and introduced him to Jermaine Dupri when he was eleven years old (who helped Bow Wow kick start his rapping career). Bow Wow has won many awards like the 2001 BET Viewer Choice Award, 2001 Billboard music award for Rap Single of the Year, Nickelodeon’s Kids Choice Award for favourite Male singer (2001) and many times he was nominated for numerous categories. Bow Wow has a 3 year old daughter from his previous girlfriend Joie Chavis. He hid this fact though and was in denial of it but later, in 2012 he admitted it and is providing a $3,000 child support. Bow Wow girlfriend presently is Erica Mena. She is a model, singer a music video actress and TV reality show Star. She currently is acting in the American series Love & Hip Hop. On Saturday’s 2014 Bet Hip Hop Awards Erica disclosed the fact that the couple has taken their relationship seriously and are now engaged. 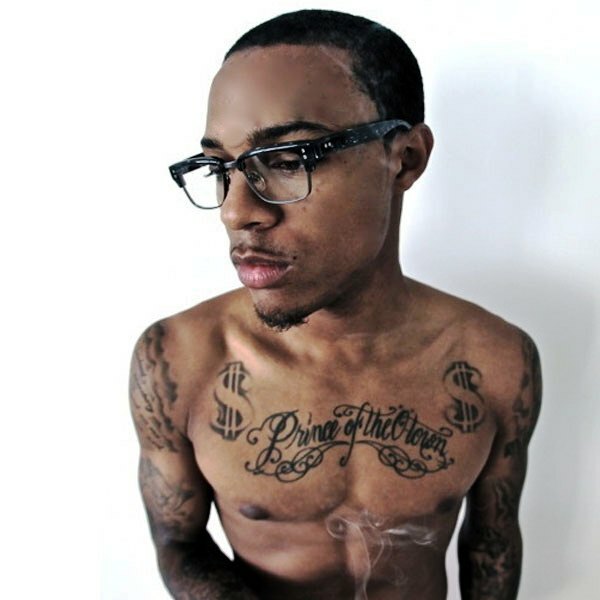 Bow Wow is known to have many tattoos all over his arms and chest. His two most notable tattoos are the chest tattoo “Prince of the O-town” with two dollar sings on top of each side and the hand paw print which reminds him of his daughter. His other tattoos are the vertical LBN letter tattoo on his right shoulder, prayer letters on his right sleeve, a clown faced tattoo on his left shoulder followed by a B letter tattoo, Teresa and Spider web tattoo on his left hand, dices on fire, a rose and letters on the right forearm and the right inner arm has a club diamond, spade, and heart tattoos.